Ever wanted to quickly share your computer's internet connection with another computer, tablet or a mobile phone but without having to deal with much settings? 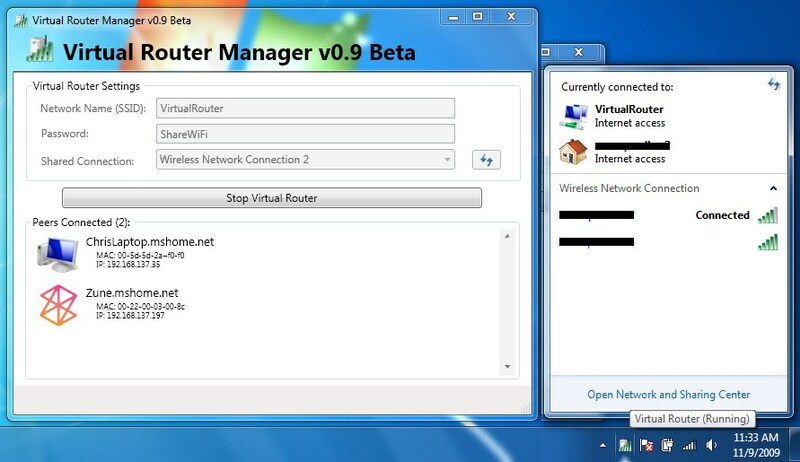 Well, here is Virtual Router - a small utility that turns any Windows 7 or Windows 2008 Computer into a Wi-fi Hot Spot just with the click of a button. Virtual Router lets you share any internet connection (Wifi, LAN, Cable Modem, Dial-up, Cellular, etc.) via your computer's wi-fi with a variety of devices such as Laptop, Smart Phones, iPod Touch, iPhone, Android Phones, Zune, Netbook, wireless printer, iPad etc. which can then connect to Virtual Router like any other access point. Virtual Router uses WPA2 to secure the connection.